A friend moves to your town. She immediately falls in love with the first man she meets. You tell her she should play the field awhile, make some friends first. Three years later, she barely knows the town nor anyone in it. The same thing happens when moving to Mexico. It’s so exotic and exciting that it’s easy for a person to fall in love with an apartment or place too soon. Every year, I think that I have found the best possible apartment and neighborhood, only to find an even better one (for my personal needs) the following year. In Mexico, you should play the field when it comes to renting. Being willing and eager to brave the low season heat in Mazatlán (I love the thunderstorms more than I dislike the heat) has given me a wide range of opportunities. Coastal areas are awash with lovely places available for rent, especially if you don’t insist on coming and going at the exact time all the snowbirds and Mexican tourists come and go. The best deals and nicest places are by word of mouth and are not advertised, even by realtors. As you come to know your particular Mexican zip code in paradise, your rental options improve every year. Here’s why. You will have local references after the first year. Local references help you in the same way here as they do at home. While they may not ask for them, if you have a year or two as a verified reliable renter, it helps establish you for the next year. You are a known entity to your realtor or property manager. You know the drill when it comes to the peculiarities of Mexico. Property owners and potential landlords know you are comfortable with Mexico’s idiosyncrasies. You are used to turning the air conditioner on and off as enter and leave rooms. You won’t immediately react with a phone call if weird smells start emanating from the bathroom or a bug the size of a small bird flies out of your dresser drawer. With a few years or tours here, you should have at least working Spanish for problem-solving. You won’t be helpless when it comes to getting something repaired. You can call an exterminator. If something breaks, you know how to find someone to repair it (with any luck a Mexican - not someone who speaks English and will likely charge you three-times what you should pay). Knowing how to handle these things make you a more desirable tenant. But you are still American or Canadian. I won’t go into all the cultural and legal reasons here about why house and condo owners often prefer American and Canadian tenants. But they do. You will make Mexican friends who will hear about special opportunities. You will begin to make Mexican friends, especially if you learn some Spanish. Don’t underestimate how vast their networks are. They usually were raised in the same city they live in, with friends dating back to grade school. They have extensive family networks. More than once a Mexican friend has turned me onto astonishing deals (like a three-bedroom, furnished house with a pool for $545 a month). You will have a better sense of what things should cost. There really aren’t any short-cuts to understanding, really understanding, a city. You have to spend time in a place to get a full feel of its neighborhoods. After three years in Mazatlán, I know that El Centro (the historical district of Mazatlan) floods and is hotter in the summer than the Marina area. I know that the Marina area is vacant of people in the summer. Knowing these things from personal experience registers differently than hearing about it from others. In apartments as in people, don’t fall for a place just because of its looks. Sometimes it's what’s inside that counts. One year I had to decide between two fabulous places in Mazatlán. One was a very upscale, four bedroom condominium facing the ocean across the street. The other, still oceanfront but with a modest facade, looked like an crumbling old Mexican high-rise hotel. At first glance, you’d think there would be no contest between the two. The first, the elegant one, was even less expensive. Both were comfortably furnished and under $900 a month. Which to choose? The resort, a deteriorating building on the ocean side, was the better choice for me. While more casual, one enters through the building’s shady side and an open breezeway from which you can see the ocean. The shade and breeze greeting you as you enter make a big difference in the summer. A working resort, it has a full-time staff on call for things like internet service (important if you’re working). Its small restaurant came in handy too. I could get to know its staff in case I ever needed a favor from the kitchen. What made the place really unique was that the apartments are two-level condos, each level giving me the same ocean view. The elevator numbers are 2,4,6,8 and so on. I live on 11 and 12. When was the last time you saw that in a resort hotel? As opposed to the dead quiet of many expat apartment buildings off-season. I liked the energy of people, both Mexican and American, coming and going through the building. By moving around and living in different places for a few years in Mazatlán, I learned what features were more important than others when I rent. Regardless of the city you choose in Mexico, I strongly suggest that you not buy anything without spending a few seasons there and get to know different neighborhoods and buildings. Every building has a different tone, its own people-culture. If you find a place you like, see if you can rent it for a few months before making any longer-term commitment. If you are considering buying, you should try to rent in at least the same area first. Noises, smells, number of neighbors, greenery, need to be absorbed on a daily basis. There are always surprises. The longer time you spend in a area and become a known entity, the more likely attractive, well-appointed places will be whispered in your ear. Each will offer its unique perspective and strengths. By playing the field, you can enjoy the adventure of several of them before perhaps settling down with your one true love. Knowing about how electric bills work in Mexico is essential and can factor into how attractive you are as a potential renter. Related link: What concierges can do for you that you probably didn’t know. Coming up: Another one of those ways you save money in Mexico that you'd never thing of. Most Recent: I've talked to several people who agree off-season is a time to get things done in Mexico. You can write a screen play, brainstorm a business or write that book you've always wanted to write. Hi, I am the author of this blog and author of the "Interactive Guide to Learning Spanish Free Online." Don't get stuck in the quagmire in your search for free online tools. Get the guide that takes you, via interactive links, to the best websites and features on the web [with lesson plans]. Don't rent blind. 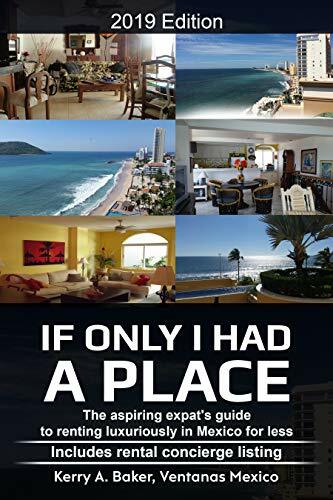 My book, "If Only I Had a Place" includes a listing of rental concierges who can make sure the place you're renting from a distance exists as described.